German "NRW Investment Award” Ceremony was held at Schtandr palace, old Dusseldorf state parliament building on June 22, 2015 local time, reported by European times 2015。The European subsidiary of China Minmetals Zhuzhou Cemented Carbide Cutting Tools Co., Ltd (ZCC Cutting Tools GmbH) won this honor. Mr. Herbert Jacob, head of NRW Investment Promotion Agency said at the awards ceremony that this year's best investment award goes to the European subsidiary of Zhuzhou Cemented Carbide Cutting Tools Co., Ltd, reflecting the diversity of NRW to attract foreign investment. Zhuzhou Cemented Carbide Cutting Tools Co., Ltd., established the European subsidiary covering the area of Europe in Dusseldorf in 2006, giving full play to products advantages of high-efficiency advanced numerical control cutting tools for modern machining, insisting on the service marketing philosophy and integrated into globalization development, combined with European localization strategy, growing gradually with normative development, establishing marketing system covering Europe. In the past three years, with 18% annual growth rate of sales revenue, Chinese high quality products and services are successfully entered into the advanced Europe manufacturing system. 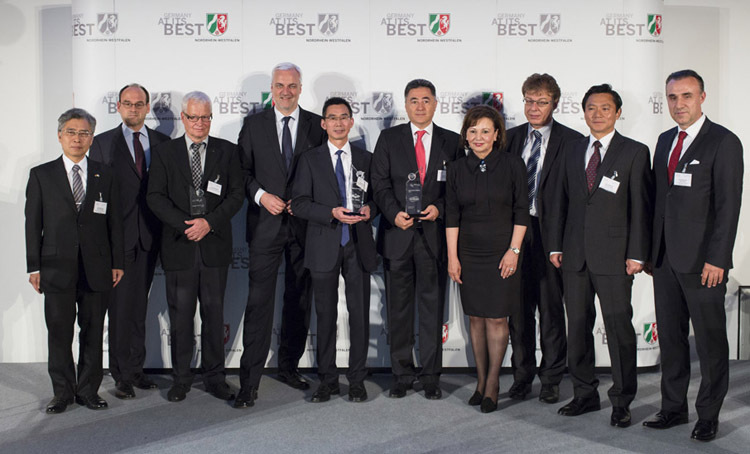 Zhao Quanliang, General Manager of European subsidiary of Zhuzhou Cemented Carbide Cutting Tools Co., Ltd., said in the award speech: "I'm very glad to receive this award, but this is not a surprise, because we have confidence in our company strength. Our products and services have reached the international advanced level, and are approval by European customers. At the same time, our localization strategy created more than 50 jobs. 95% of the company personnel are local people." Ms. Petra Wassner, Director of NRW Investment Promotion Office, said to European Times reporter: At present, nearly half of Germany’s overseas investment comes from Asia. Nordrhein-Westfalen brought in 330 foreign investment projects, accounting for one quarter of the total number of Germany. Last year, NRW’s foreign investment created 4300 jobs. The European subsidiary of Zhuzhou Cemented Carbide Cutting Tool Co., Ltd owes its success to the good enterprise image, and more to the power of China's high quality products, which is very critical. As an annual award, NRW Investment Award is decided by German NRW Ministry of Economic Affairs and Investment Promotion Agency. It has been issued for 10 times. Chinese enterprises XCMG and HUAWEI received it in 2013 and 2014 respectively. The European subsidiary of Zhuzhou Cemented Carbide Cutting Tool Co., Ltd (ZCC Cutting Tools GmbH) is the third Chinese enterprise to win this prize. We are Trusted Home Builders! Get a quote now! SK CUTTING TOOLS SOLUTION PVT LTD is the leading company in the field of cutting tools in india with more than 10 years experience. We have a fantastic range of Quality Refurbished products available. We transform your spaces with simple and budget-friendly solutions. Find the best lightning construction & maintenance services in London. Chinchwad , Pune - 411033. Copyright © 2016-17 Website designed by OMX Technologies.